All #MapLesotho and OpenStreetMap enthusiasts will be aware that Portmarnock Community School are enthusiastic mappers of Lesotho and have entered their activities into the SAGE World Cup for Social Innovators under a project titled “Global Citizens Mapping the Future”. This year the competition took place in the city Of Odessa, The Ukraine. The competition had 32 teams, and the semi finals were hotly contested with Canada, the USA and Israel. The Portmarnock students were grilled by enterprise dragons after making a short pitch for why using OpenStreetMap leads to other innovations. “What is impressive about this is that the students went from simply learning how to map everything, to thinking of the whole thing as a database. Soon after they were making applications, and writing reports for the Lesotho Government about soil erosion. 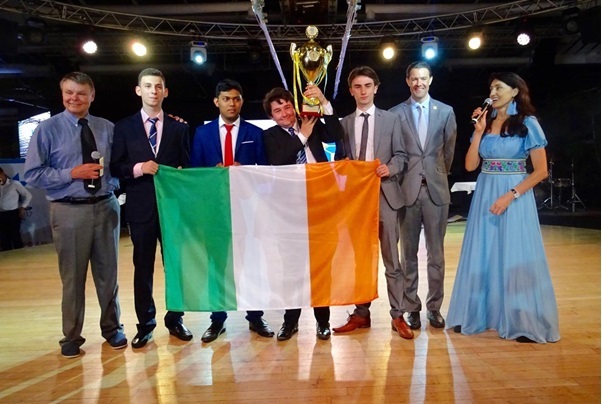 We knew that was something special before the award, but this victory confirms beyond any doubt that this was something special and helped them apply what they learned”, said Ms Colette Cronin Maths teacher at the school. This achievement is a credit to the school community, the teachers, the board of management, the partners and sponsors and Fingal County Council who introduced mapping to the school in 2014. However, full credit goes to Colin McAndrew, Ravikanth Gollapalli, Ahmed Jouda and Luke Peyton who did all the work and preparation for this win.